In the context of Clint Eastwood's career as a star, an actor, and a filmmaker, "Gran Torino" is an endlessly fascinating movie. If only it were a good one. Eastwood, of course, has long since reached the point where he can do as he damn well pleases, and one of the things that has pleased him in recent years is to drop a movie at the very end of the Oscar season and thoroughly reshuffle the field. "Million Dollar Baby" was one such movie; this awkwardly conflicted drama about inner-city racism, struggle, and redemption is not. Still, if you want to see Dirty Harry collide with Eastwood's idea of the real world, "Gran Torino" is something to see. In what he has announced is his final acting performance, the star plays Walt Kowalski, a Korean War vet and retired Detroit auto worker who has watched his inner-city neighborhood dwindle away until he's the last white man standing. The film opens with his wife's funeral - Walt's dutiful, blobby sons (Brian Haley and Brian Howe) drive in from the suburbs with their nasty little children - after which the widower retires to his front porch like an old soldier surveying the battlefield. Down the streets ride the gangbangers, cruising like complacent sharks; the surrounding houses are filled with an influx of immigrant Hmong, the mountain people of Southeast Asia. Walt looks at the mess the newcomers have made of their properties and growls. Really: He growls, like a cartoon dog. "Gran Torino" shifts into gear when Thao (Bee Vang), the shy teenage boy next door, is bullied by a Hmong gang into trying to steal Walt's prize possession, a green Gran Torino that sits shining and undriven in the old man's garage. Walt brought it off the factory line himself, and so it stands for an entire vanished world - not to mention a vanished economy - that's well worth protecting at rifle point. To atone for Thao's shame, his family orders him to help Walt out around the house, whether Walt wants the assistance or not. (He doesn't.) The scenes in which the two come to know each other form the heart of "Gran Torino," and the scenes between Walt and Thao's sister Sue (Ahney Her, giving the film's breeziest performance) are the film's brain. Upwardly mobile and brutally illusion-free, Sue patiently instructs the retiree in the ways of her people and the ordeal of climbing up America's ladder. There's sentimentality to this story, and it's honest enough, but Eastwood has decided to keep it at bay by making his hero an unapologetic, venom-spewing racist. In part, this keeps the audience off-balance, because we're never sure when and if Walt will disappear down the Korean foxhole in his mind. "Gran Torino" is alive to the web of racial and ethnic discontent in this country, but the script by Nick Schenk and Dave Johannson has a tin ear. When Walt and a barber friend (John Carroll Lynch) try to teach Thao how to cuss like a real man, the humor of the scene works but the language is dreadfully forced - a screenwriter's conceit of how "real people" talk. So much of "Gran Torino" plays like this - heartfelt and smart but with fatally off-kilter rhythms and thin, unbelievable characterizations. (Would suburban parents really let a teenage girl wear a belly shirt to her grandmother's funeral? I don't think so.) Eastwood is consciously playing with stereotypes here, up to and including a callow young priest (Christopher Carley, doing what he can with a thankless part), but he only brings them partway into the modern world. Tonally, the movie's a botch - a melodrama that wants to be a work of realism but can't figure out how. One of those stereotypes, obviously, is the urban avenger Eastwood spent much of his early career establishing (with a lot more complexity than most critics credited him with at the time). Walt probably saw "Dirty Harry" more than once back in 1971, and it's certainly how he thinks the world should behave. 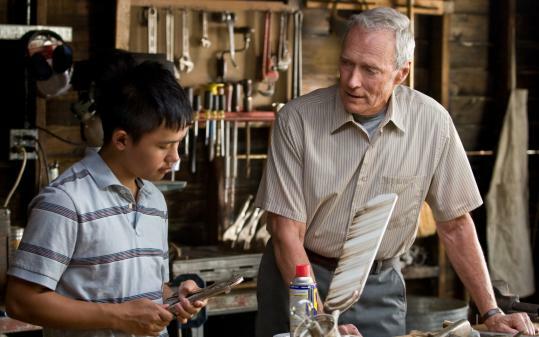 The real drama of "Gran Torino" lies in watching the character's black-and-white mindset melt away under a steady diet of Hmong home cooking, replaced by a starker sense of duty. It works and it doesn't. The scene in which Walt faces down a group of street toughs harassing Sue is both gloriously funny and suspenseful, because this old, unbreakable man so completely crosses these bad boys' wires. Yet as "Gran Torino" builds toward its conclusion, everything Eastwood is trying to stuff into one simple movie - justice, revenge, melting-pot America, career summation, religion - topples over into something much too close to camp. Are we ready for the Last Temptation of Clint? That's what we get here. Your reaction may depend upon how much affection you bring to this film, for Eastwood the ornery, intelligent movie icon, and for Eastwood the questing filmmaker. Some people have come out of early screenings intensely moved, others shaking their heads. The man has made the movie he wanted to, so the only question remaining is whether you feel lucky. Well? Do you, punk?